I made these for Dave on Christmas day since he is a major pancake lover. I used my regular pancake recipe to make the batter, but you can use whatever batter recipe you like best. Put a ladleful of batter on a hot, greased griddle. 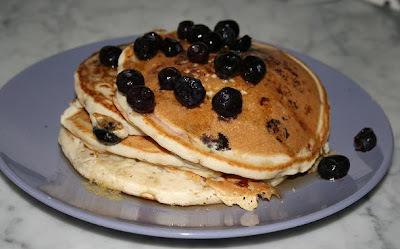 As soon as the batter sets on the bottom, sprinkle some fresh, or defrosted blueberries on the pancake. Add a few small dollops of ricotta that has been sweetened with a bit of powdered sugar. Flip the pancake, and cook until the bottom side is browned. Serve with syrup, or powdered sugar.